I am so happy you want to learn more about the Battles of Markra. I invite you to read the first two stories in the Markram Battle series below. 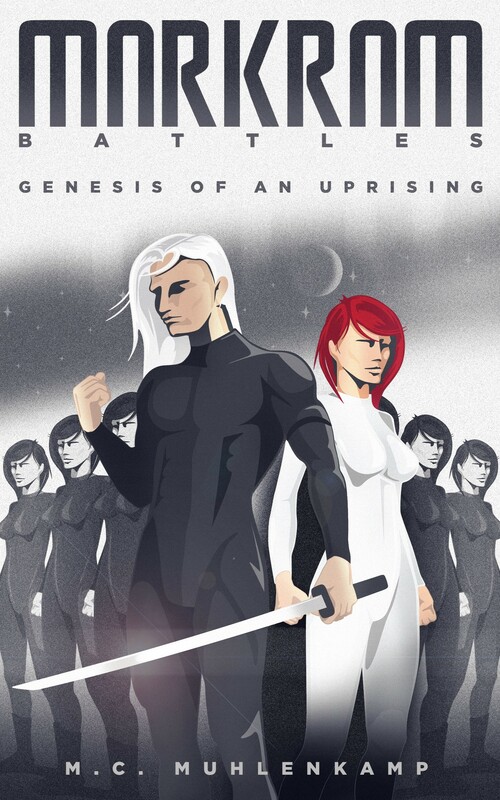 If you want to download the entire Volume of Genesis of an Uprising you can do so through my tribe link, which also gives you access to exclusive content and email updates. Registration is fast and simple, all you have to do is sell me your soul. Just kidding, click here. Hope you enjoy the first two stories. Courage in battle and honor in death! The unit leaders, or what is left of them, stand motionless, perfectly poised, and unresponsive. They resemble black armored trees rooted to the glass floor in the midst of a stark white room. I inhale deeply as the Major General walks in and pours the full intensity of her expression over my squadron. Her white leather uniform wraps tightly around her body and emphasizes her curvaceous form, while her glossy white hair, fastened into a ponytail, exposes her slender neck and soft features. She blends in perfectly with her surroundings, like a white flake amidst a snowstorm. I am suddenly reminded of the first time I heard her characteristic expression. That day will be embedded in my brain forever, like the genetic code of my DNA. I had just been assigned to oversee the training of this squadron and I had no clue what I was doing. The Major General, on the other hand, wasn’t only experienced, but shockingly brutal, both in her remarks and measures. Back then, all unit leaders in this squadron were merely boys, and there were more of them. I remember them standing in front of me, frightened, confused, and some even teary-eyed. I recall walking between the crooked rows, making changes to their posture before the Major General arrived. She stomped into the room and nodded dismissively. I still remember the way her loose hair shifted around her shoulders with every movement. She was strikingly beautiful. That morning I stepped aside as she made her way to one of the boys in the front row and wiped the tears away from his shimmering blue eyes. “Tears are a sign of weakness,” she hissed. Without warning she wrapped her hand around his face and released her extrasensory shock, allowing electrical waves of physical pain to flow out of her. The surge of power blazed out of her hand in flames of white fire, wrapping across the boy’s entire body. He convulsed from the shock and fell to the ground with a loud thud. “They will start training immediately,” I said, attempting to clear the contemptuous atmosphere the Major General had brought with her. “Not in so many words,” she answered flatly. “Your extrasensory ability is memory retention, is it not?” she asked. “Yes, perfect retention and recall of information. While my ability may not inflict physical pain or have the capacity to control a subject, I am sure even you, Major General, can appreciate the advantages of such an ability in furthering our Empire’s goals,” I replied. “So, when will the new languages be introduced?” I asked, effectively redirecting the subject. I frowned at the use of the term human, as if they belonged to a completely different race. Our first studies of the new planet, discovered among a new cluster of galaxies, yielded unprecedented results. Humans, as they referred to each other, were simply at an earlier stage in the evolutionary process. Their genetic development was noticeably slower due to evolutionary changes driven by population growth and cultural shifts, but their trajectory of biological evolution continued to show genetic modifications. The only physical disparities between our races could be found in hair and eye pigmentation. Genetic mutations among Markrams evolved into the complete loss of melanin in hair follicles and multilayered microstructures in the irises. The effects of these mutations resulted in the absence of hair coloration and the appearance of iridescent colors in our eyes. However, in spite of our physical differences, we were able to infiltrate their governments and social organizations without suspicion. The Major General walked toward me and contemplated me thoughtfully. “Have you ever supervised a training before, Commander?” she asked. I recall how quickly she stiffened, almost as if a lightning bolt had stricken her. “Commander?” she asked. The vacancy I saw in her expression that day gave me a small glimpse of the darkness within her. She was an empty vessel, a Markram carcass devoid of soul, numbed and lifeless. Even today, as she stands before me to supervise the final assessment of the same squadron of unit leaders, though many years have passed, I cannot help my aversion to her desensitized demeanor. She smiles, but it is unbecoming. The hideous grin contorts her face in a way I cannot find words to describe. She paces in front of the unit leaders, slowly and meticulously, looking into their expressionless eyes as if waiting for something, but they all just gaze into the distance like unresponsive machines. Only one of the unit leaders seems to study her whenever she isn’t watching. He has always been the strongest one, not necessarily in the way the Major General expects, but she doesn’t need to know that. I don’t know his real name. In my squadron he is simply known as Seven. His long white hair, as opposed to the short haircut every other leader uses, and iridescent blue eyes, the likes of which I had never seen before, make him stand out. But, if I have to be completely honest, it is much more than that. All of the unit leaders in my squadron, underneath their hard, unforgiving façades, are ready to collapse. They have no sense of pride, no sense of belonging, no sense of self-respect. Their training successfully stripped the life out of them. They are owned by the battles and they don’t resist that. They live only to serve. Perhaps that explains their efficacy in mock battles; their lives aren’t theirs, and they know it. Seven has always carried himself differently. His personal pride and self-assurance radiate out of him like a flowing river; his life is his own and no one will convince him otherwise. His training had to be severely modified, but no matter how much he was punished, nor how harsh his physical and mental exercises were, he never relented. He fights the battles, but the battles don’t own him. Seven has the highest scores in the squadron. He has won every mock battle, making him the Chief Leader. But in reality, I had always expected it to be so. Not only because he moves differently than the other leaders, but also, because he thinks differently. He uses his unit as a team, a combined effort of survival. No unit leader, from my squadron or otherwise, can match his skill. The Major General stands in front of him, blocking his view, but his eyes are set off in the distance. She looks content, and probably reads his unresponsive behavior as an expression of undying submission to the system, though it has more to do with his defiant character. “His human language results are the best I’ve seen so far,” the Major General says, using one of the human languages taught to the squadron. Seven blinks directly into her eyes. The Major General steps back, and gasps in response. He seems pleased by my objection, but before I can utter another word he blinks back into the distance. The Major General’s expression grows even more unpleasant, as if that is even possible. She takes another step back and after moving her eyes up and down his body, places her hand over his face. I chuckle at the sight. The same frightened boy who collapsed in front of her many years ago, now stands firm, barely shaking in spite of her electric outpour. The Major General’s nostrils flare angrily, like a wounded animal ready to strike. “You will resume training immediately and shall be held unfit for battle until I deem it so,” she says. “Seven is fit for battle now,” I say. “Are you willing to present your allegation in front of the Board, Major General?” I ask. The Major General freezes in place; anxious and taken aback like a helpless rabbit. Her eyes move up and down, scornfully judging me, until I think they will burst out of their sockets from the pressure. Sweat outlines her brow; timid drops of anger against her pale skin. After a long pause, she walks toward Seven, dragging her feet like a discontented child, and pins a badge over his shoulder. I smile openly, pleased as she validates my argument in this simple action. She stands next to me, ready to dismiss them, and I turn to address them. “Courage in battle and honor in death,” I say. “Courage in battle and honor in death,” they reply in perfect harmony. A human girl lies at my feet, bruised and unconscious. Her pale skin shines in the dim light and her red hair fans over the floor, draping around her delicate features like a blazing sunset. Attracted by the intense hue of her long fire-colored locks, I crouch down and rub a strand of hair between my fingers. Her freckled cheeks still burn bright red from my sensory extraction only seconds ago. I can still feel her physiological responses coursing through me, though her senses have already begun to recede from my lungs. I wasn’t expecting the ferocity of her resistance, but the moment I extracted her senses to incapacitate her, the piercing energy exuding from her caused me to freeze on the spot and made me forget where I was. Two junior leaders pick her up and follow me to the shuttle, where I find the Commander waiting for me. He stands motionless at the edge of the ramp, like an untarnished sentry against the vibrant chaos of this planet. Three black stripes are clearly visible over the pointed shoulders of his white uniform; indisputable indications of his rank. The Commander’s glistening black eyes lock with mine. “Seven,” he greets me. I respond with an affirmative nod and he moves aside. The dark walls of the solid transport enfold me as I step forward, engulfing my armored body like an appendage of its dominion. I move through its cold passageways, traversing the vast network of burnished chambers toward the recruiting cells. The gates of compartment number thirteen glide away and I watch as the two junior leaders lay the unconscious human in the middle of the enclosure. After taking my seat in preparation to leave Conscripting Sector 32—or Earth, as humans refer to it—my eyes sweep across the horizon of shattered buildings. The hostile territories of Sector 32 continue to disappear as our Sectoral Government claims the land. The developments of achromatic structures, which coalesce together to form the conscripting fields and societal enclosures for humans, also proceed at a fast pace. I focus my attention on the shiny spiraling towers that can be seen in the distance around the recruiting zones. They reach up into the sky like tentacles of glass. A few hours later our ship arrives at Training Sector 11—one of the planets with the sole purpose of housing instruction facilities for conscripted prisoners. I look out the window, smiling at the sight of the giant saucer towers protruding from the ground in consecutive rows. Pale blue lights twinkle in the distance, illuminating the cities at their base. We land atop Facility 57 and I exit, anxious to begin the training of my unit. Each of the female recruits is ushered out of the shuttle, their expressions of horror reflecting on every glossy surface. Recruit Thirteen exits last. She enters the building, studying every aspect of her surroundings, and, when her pale green eyes find mine, they seem to darken in response. I smile invitingly and she looks away. I can’t help but notice her hair cascading over her shoulders and down her back in ripples of fiery waves. I fold my arms in front of me and squeeze my fists tight, wondering if she will perform as I expect. I need her to. She has no idea how much. Each of the thirteen recruits is fed, assessed, and suited upon arrival. They are given official training gear—white jumpsuits and training boots—followed by a tour of the accessible areas of the facility. I trail behind the junior leader escorting my unit to their living quarters, and my eyes scan the white simplicity surrounding me. Bright glossy surfaces reflect my dark armor like a ghostly shadow as I move through the corridors. We reach the sleeping hall and each recruit takes one of the single beds arranged in consecutive rows. My attention drifts toward Thirteen, and I drink in the sight, completely mesmerized by the pronounced contrast of her red hair against the colorless walls. She sits down, presses her elbows against her knees, and rests her forehead on her clasped fingers. Something about her presence disturbs me, but before my mind can begin to wonder what it may be, I turn around and leave. The very next day I meet my unit at the training field. “Recruits, I salute you. I am the leader of your unit. My unit leader identification number is one-one-five-seven-two-eight-seven, which indicates my location and rank in the Battle Forces of the Markram Empire. Each of you has been given a similar number with the addition of a recruit position within the unit. You may use your position numbers to refer to each other. You will call me Seven. The use of any other names in our Battle Forces is forbidden.” I point to the soldier at the end of the row and continue. “Junior Leader Twenty-Seven will assist me with your training. However, you will receive all of your training directly from me. Learn from me. Follow my every order and you might survive. As fighters there are two principles that you will do well to remember, courage in facing your battle and honor in death.” I glance toward Thirteen and smile conspiratorially. “Each of you will be paired with the person on your right. Thirteen looks over at the junior leader just to her right and clenches her jaw as if she could crush him inside her mouth. “Take a sword,” I command. Each recruit takes a blunted sword off the ground, except Thirteen. “You can’t make me,” she says. The week progresses without change. Soon, the memories of my own painful trainings become hazy recollections of anger, compared to the frustrating agony I endure with her on a daily basis. No matter my approach, she doesn’t relinquish that stubborn resistance I must break. I need her to crack, shatter into a million pieces, so that I may build a compliant fighter from the wreckage. Two weeks after conscription I walk onto the training field and dismiss the entire unit with the exception of Thirteen, the junior leader, and two other recruits. Twenty-Seven steps aside at my command and I growl, vexed by my unexpected reaction. I see recruit Nine glancing in my direction, her brown eyes, which match her skin perfectly, reach out to me, asking for permission to engage. I nod and she steps forward. 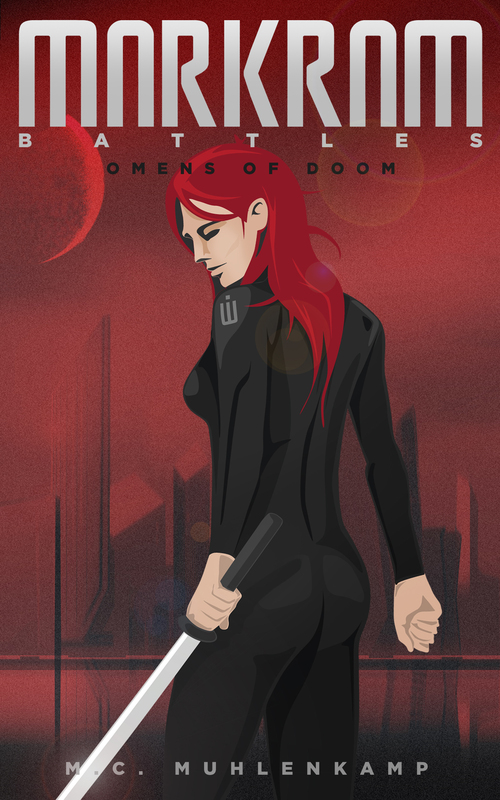 She raises her sword high above her head and strikes Thirteen with the flat side of her blade. Thirteen grunts in pain, but the hit barely shakes her. I reluctantly nod again and Nine repeats the punishment. Thirteen’s training continues until nightfall. After hours of continuous discipline she finally falls to the ground, but still, she doesn’t relent. “Is death really all you desire? You will forfeit your life so easily?” I ask exasperated. I snarl, unable to control the frustration building inside of me. My gaze is drawn toward her legs as the shakiness is completely replaced by her signature unyielding strength. My eyes continue to move up her body, carefully gazing over the shape of her figure, and though a part of me wants to stop, the other, more powerful part, has already begun to trace the curve of her hips. By the time I regain my senses, my head is spinning. I work my way down the looped corridors leading away from the training fields, walking through the transport stations, training zones, and into the domiciliary quarters without taking much notice of anything. I walk into the sleeping hall, turn into my compartment, and sit on my bed. Collapsing back onto the sheets, I feel like a concrete edifice plummeting into the sea. I crack my knuckles and rub my forehead, unable to relax. Eventually, I stand up, only to pace aimlessly around the small room. My eyes drift to the window, and I fix my attention on the three moons shining brightly against the dark sky. Still clenching my fists, I lay back in bed, unable to shake my thoughts as I stare up blankly at the ceiling. Replacing Thirteen would be the easiest course of action. I should just comply with the Commander’s instructions. I can’t afford to lose any of my battles, and though I know she could greatly enhance the performance of my unit, she could also ruin my chances. My life and freedom depend on it, and I refuse to go down, even with the honor bestowed by a glorious death. Still, the idea of replacing Thirteen to achieve my objective twists my stomach beyond the point of endurance. The mere memory of the physical pain I put her through today nearly drove me out of my mind. How am I supposed to watch her fight in the Arena when her every expression of pain stabs my insides so mercilessly? I close my eyes, feeling the repressed tension creasing my forehead, and with a deep exhale I stand up again. The emotions stirring inside of me cloud my thoughts, and for a second I am overcome by anger. How can I allow a mere human to trigger such strong responses in me? Maybe if she were Markram, I might consider fighting to win her over and earn her favor, after achieving victory in the battles. After all, it would be my right. But Thirteen is a recruit, an inconsequential pawn, intended only to fight and die for entertainment. I shut my eyes tight and bite down in frustration as reality strikes me. She may be all of those things, but at this point, so am I. Only victory can change my future. The night progresses without respite. The next morning I am informed by my junior leader that Thirteen spent the night in the infirmary. I make my way to the medical wing and my heart sinks deep into my stomach at the sight of her. Thirteen has been strapped into a disciplinary board—a stand-up metal enclosure with leather straps used to encourage compliance. Her white jumpsuit is unzipped in the middle and folded down around her waist, revealing a thin tank top and exposing her bare arms. I stop in my tracks, aghast at so many bubbled patches of burned pink flesh. The junior leader enters the room and stands in front of me. Before he can utter a single word, and in spite of regulations prohibiting the use of extrasensory abilities against other soldiers in the Imperial Army, I grasp his throat, extract his senses, and let his unconscious body hit the floor. I make my way toward Thirteen and caress her cheek. Her soft skin against my fingertips makes my heart hammer loudly against my ribcage. Physician Fifty-Four arrives a few seconds later and without needing instruction, places her hands over Thirteen’s arms and proceeds to use her extrasensory heal. I grimace at the emerging burns on Fifty-Four’s skin, wondering how painful they must have been for Thirteen. The physician’s newly acquired injuries are gone by the time she finishes the healing process. Fifty-Four leaves and I unfasten the leather straps securing Thirteen to the metal board. Kneeling to remove the strap at her ankles, I can feel her gaze on me and hear the zipper of her jumpsuit as she covers herself. Though I want to, I can’t bring myself to look at her. I keep my expression focused away from her as I stand up. “Why do you care?” Her tone is soft and confused. Thirteen looks away, seemingly confused by my sudden honesty. Her chin begins to quiver and she has to clench her jaw to make it stop. By the time her eyes return to me, her expression is different. Her resolution has bent slightly, allowing doubt to shake her foundation. I close my fists in an attempt to remain still, but my fingers find their way back to her cheek anyway. I trail the line of her jaw from her temple all the way down to her chin. For the life of me, I can’t bring myself to stop. My hand moves slowly down her neck, finally stopping at the hollow of her throat. Thirteen’s chest heaves under my palm, sending prickling sensations all over my body, and it takes all the resolve I possess to remain motionless. She slowly steps away, grasping her neck. Her fingers brush the spot I had been touching a moment ago, and her eyes flicker. I hold them as she walks past me, her mystified expression wrapping around me with surprising intensity. The charged energy traveling between us holds me in place, speechless. Thirteen walks around the unconscious junior leader without looking at him, and stops just as she is about to step out of the infirmary. I turn away, dumbstruck by the overwhelming emotions traveling through me. “I will fight,” she says. I look up just in time to see her long, fire colored hair trailing behind as she vanishes from view ›› Want to Read the Third Story From Thirteen’s Point of View? Click Here. If you want more, check out all the bonus materials available on the site. You can also read as I write through Wattpad, just keep in mind these are the unedited versions of the stories. Once you have absorbed the gush of information, I hope you will share these stories with your friends. Spread the word, follow me on Instagram or become a fan on Facebook. Even better, if you haven’t sold your soul to me yet, this would be a great time to do so, just click here. Whichever way you go, know that I appreciate your support and hope you keep following the battles of Seven and Thirteen. Courage in battle and honor in death!